When we discuss the reasons for the Atlanta Hawks’ success this season, we tend to speak in generalities. All of these statements are true, but they don’t necessarily help us understand the transformation Atlanta has made into becoming a legitimate NBA title contender. Also, for as unselfish as the Hawks have been with moving the ball, it’s no sure thing in today’s NBA that more passes leads to better offense. In fact, the two teams leading the NBA in passes per game are the Utah Jazz and New York Knicks. Utah averages 45 more passes per game than Atlanta, but has just the league’s 15th most efficient offense. As you can see, the top seven passing teams all vary wildly with degrees of success. Passing generally leads to better shots. However, when the passing lacks clear purpose, it simply winds the shot clock down and forces players to beat the clock with attempts outside of their comfort zones. 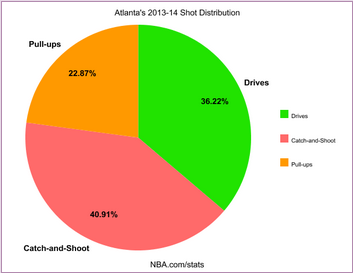 So while Atlanta is one of the NBA’s best passing teams, that’s not the lone reason the Hawks have been dominant. So, what gives? How has Atlanta surged into an offensive powerhouse? I’ve been investigating that question all season, and have gained a pretty strong grasp on what’s made them click. There are two analytical secrets to Atlanta’s success that the Hawks have exploited, and the results have transformed them from middling East pesterer into a powerhouse. 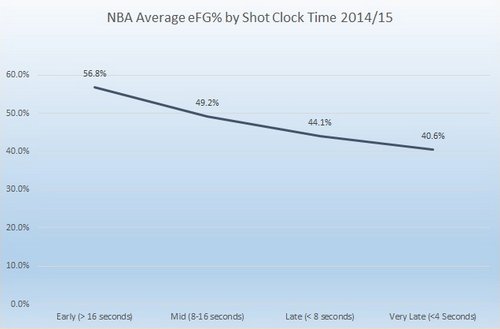 Clearly, not all shots are created equal, but how much variability in quality is there in shot type? I’ve tracked the 70,000+ jump shot attempts (outside of 12 feet from the basket) from the 2014–2015 season, and detailed the advantage of field goal attempts out of a catch-and-shoot situation rather than a pull-up. While the percentage differences may seem negligible, make no mistake: the advantage that comes from catch-and-shoots is big enough to decide outcomes in games. Atlanta lost 13 times by five points or less last season. 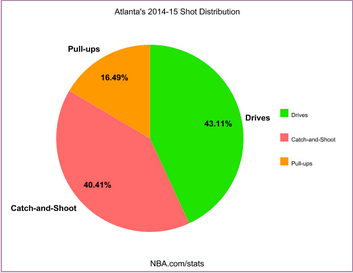 The data from last season and this one suggest that Atlanta surely is aware of the shot-type advantage (or, in this case as shown below, disadvantage) and has made a concentrated effort to reduce its pull-up shot attempts. With approximately four extra possessions saved from lower efficiency shots, Atlanta has concentrated on infiltrating the interior off the dribble. Currently, Atlanta is attempting 6.4 more drives per game than last year. What’s interesting is that while most teams experience lower efficiency rates with increased attempts, Atlanta has actually become a more efficient driving team this season — improving their 41.9 percent drive conversion rate (25th ranked in 2013–14) to a 46.1 percent clip (14th ranked in 2014–15). This can best be explained by Dennis Schroder’s emergence as one of the league’s most prolific drivers. Schroder is the only player in the league who plays less than 20 minutes per game yet still has attempted more than 350 drives for the season. He also converts his drives (48.8 percent) at a higher rate than All-Stars Kyrie Irving, Jeff Teague and Russell Westbrook. Only Houston attempts more catch-and-shoots from the perimeter, but the Rockets convert at a much lower rate than Atlanta. 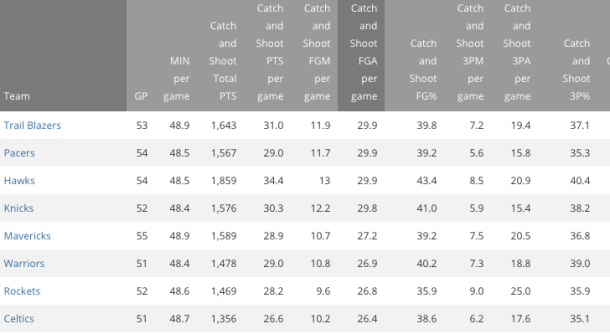 Personnel is key here: led by Kyle Korver, the Hawks are on pace to be the league’s only team to shoot better than 40 percent from deep on catch-and-shoots. It’s important to clarify that if the strategy isn’t totally intentional, having their roster built this particular way is. One Eastern Conference scout familiar with Atlanta’s front office — speaking on the condition of anonymity — believes the team traded pull-up happy Lou Williams to Toronto over the summer precisely to replace his minutes with better defenders who have better catch-and-shoot tendencies (i.e. Thabo Sefolosha and Kent Bazemore). But for as analytically sound as Atlanta’s offense has become, it’s really the team’s defense that has made the Hawks the powerhouse they’ve become. Much in the same way critics are skeptical about whether the team can win a championship without a true “go-to” superstar, they also are wondering whether Atlanta can maintain its elite defense without a true rim protector. Atlanta ranks second in the NBA in transition defense, allowing just 2.52 points per 100 possessions in beat-back-on-defense situations. So, what does that mean exactly? 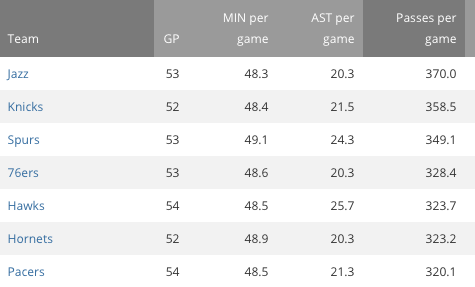 In comparing that number with Cleveland’s 4.01 points per 100 possessions in beat-back situations and adjusting to account for possessions per game, Atlanta’s approach translates to a 1.34-point defensive advantage. In other words, against Cleveland, Atlanta’s essentially starting the game with 1.34 free points on the board. It’s an analytically-savvy strategy that very few teams employ. Sacrificing offensive rebounds for the sake of limiting fast break opportunities has slowly gained traction around the league but the Hawks remain the most aggressive of all. As for why Atlanta’s defense has improved so dramatically this season (besides the obvious benefit of having a healthy Horford back on the floor and the welcomed additions of Sefolosha and Bazemore), the players attribute their defensive success with increased familiarity to the game plan. “It was tough to give up,” Korver said. “And I’m not even a big offensive rebounder. I probably had like 10 in my career. But still, you don’t really think about sprinting back on defense. Luckily, I came from Chicago with Thibs, where he was crazy about it. I mean, if I even took a step towards the basket (for an offensive rebound), I was getting yelled at. For me, it maybe wasn’t as big of a deal. For a lot of guys, it’s about opportunity. You’re taught that playing hard means going for the offensive boards and trying to get an extra possession. For a lot of guys, it is tough to give up on. Millsap still leads Atlanta with 1.7 offensive rebounds per game — but it’s a far cry from the 3.3 he averaged early in his career with Utah. Still, as Millsap pointed out, to say he’s sacrificed offensive rebounds completely may be an exaggeration. When we hear the media talk about Atlanta’s players “buying into the system,” they point to the ball movement on offense. In actuality, Millsap’s quote above is the best possible example of a player buying into the system. Millsap used to love (and thrive individually) battling for offensive boards. Now he’s not only willing to surrender those battles: he genuinely understands his team is better off because he does surrender those battles. Budenholzer has implemented a strategic revolution. Now his players have bought in, and are dominating the league through its application.